Choosing the right electric guitar strings can make or break the sound your guitar produces. Extensive research has been done, comparing the top electric guitar strings against one another in the areas of performance, durability, brightness, tone, cost and longevity. These three choices topped the charts in all of these categories. Every guitar has to have strings in order to be played of course. If you are new to playing, you may not realize the importance of a high quality set of strings and the effect they can have on how your guitar sounds when you play it. The right set of guitar strings can even feel different than a cheaper, low quality set. It doesn’t matter whether you are a brand new player that hasn’t strummed one note, or a seasoned professional you will want to put thought and care into the strings you choose. With the large number of strings available on the market, it may feel a bit overwhelming to look at the selections and know what to. That is why we have provided these top electric guitar string choices along with the informative buyer’s guide below. With this information, you will understand what makes a good guitar string and how to select the right set of electric guitar strings for your instrument. These high quality electric guitar strings are designed to be superior in sound and will create an important link between you and your guitar. Each string is precision wound with highly magnetic, nickel-plated steel. This steel meets all exactly requirements. 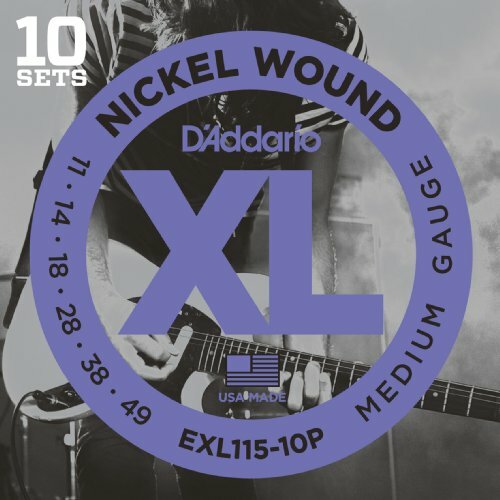 These EXL110-10P guitar strings are D-Addario’s best selling electric guitar strings on the market. These electric guitar strings have long lasting tone that is bright and clear and excellent intonation as well. No matter what your musical style is, these strings will complement it. XL Nickel wound strings in regular light are the ones chosen by many professional guitar players around the world. 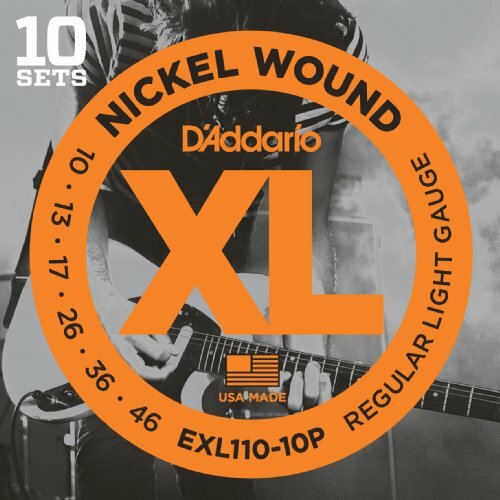 D’Addario’s Nickel Wound Medium/Blues-Jazz Rock electric guitar strings provide moderate flexibility and a tone that is rich and full. Made in the USA, guitar players are assured of strings with the highest quality and performance every time they play. Each string is round wound with nickel-plated steel for a distinctive bright tone that is consistent with all D-Addario strings. Nickel-plated steel is known for its bright tone and distinctive sound. They are the standard that other guitar strings are compared against, no matter what your preferred playing style is. 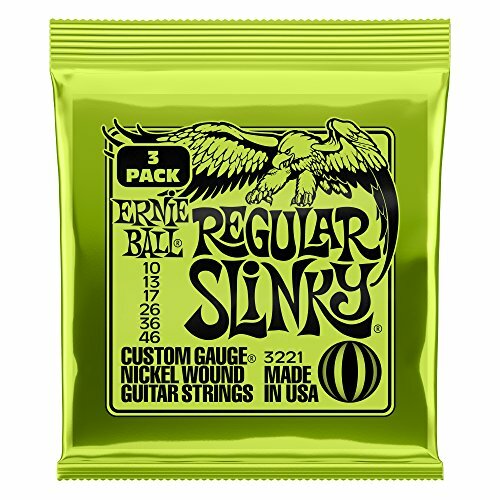 Ernie Ball Regular Slinky Electric Strings are the favorites of many musicians all over the world. These Regular Slinky electric guitar strings have been played by musicians such as Steve Vai, John Mayer and Eric Clapton as well as thousands of guitar players who are not celebrities. They are created to meet the highest standards and exact specifications that will provide the guitar player regardless of experience, with consistency, long life and optimum performance too. These plain strings are made of tin-plated, high carbon steel that has been specially tempered to provide users with a tone that is well balanced and pleasing. They are made from nickel plated steel wire that has been wrapped around a hex shaped steel core wire. Users will love the sound their guitars will have when they use these high quality strings. The 10-46 string sets were created by Ernie back in 1962. The creation of these strings at that time, provided musicians with the ability to use the guitar in ways it hadn’t been before. Tone, quality of sound and durability were just a few of the special features that these strings have. Guitar players are very serious about the strings they use on their instruments. The better the quality of the guitar strings, the better sound and intonation you will have. Choosing the right guitar strings, when there are so many to choose from, can be a daunting task. Our goal is to make the decision making process much simpler by providing you with three of the top choices in guitar strings. Extensive research has been done, comparing the top electric guitar strings against one another in performance, durability, brightness, tone and more. These three choices topped the charts in all of these categories. Read more below about electric guitar strings in our buyer’s guide. With the right information, you will know what to look for and deciding on the right strings for your instrument will be much easier. You can be assured that you have what you need to make a confident decision. The right decision will give you the sound you’re looking for. How Often Should Electric Guitar Strings be Replaced? How often you change your strings will depend on several factors, one of the most important being how you play. If you strum the strings hard or have a lot of dirt and oil on your hands, the strings will wear out sooner. Additional factors include the quality of the strings the player uses and if they play every day or not. The majority of guitar players keep at least one extra set of strings in their guitar case for necessary string changes. How to Know if the Strings Need Changing? There are several things you want to look at to determine if it’s time to change your electric guitar strings. We have outlined these things below. There are a few different kinds of electric guitar strings available. The thing that determines which ones you use is personal preference, overall. Each type of guitar strings will have a different sound. Different types of strings will be better for certain types of music. Try different types and see which ones you like the feel and sound of the most. There are 5 basic gauges of electric guitar strings: extra super light, super light, light, medium, and heavy. The gauge has to do with the diameter of the string. In general, the lighter gauge string you use the easier it is on your fingers. It is always better for a new player to start with a lighter gauge string and then work up to the heavier gauges as you gain experience. The gauge of the string that you choose has a large influence on both playability and sound. We have outlined some specifics of lighter gauge strings and heavier gauge strings so you can tell the difference. Roundwound – This is the most common winding. The core of each string is round steel wire that has rounded wire wrapped around it the length of the string. Flatwound – Bass guitar players and jazz musicians tend to like flatwound strings. A round wire is wrapped in flat wire which provides the player with a mellow, tonal quality that lends itself well to jazz and blues music. Flatwound strings are more expensive than the ones that are round wound. Another benefit to flatwound strings is that they are easier to play for longer periods of time and cause less noise and wearing on the fretboard. Halfwound – Sometimes half wound guitar strings are called semi-flat wound. They are made using the same round wound process but will have heavier gauge wire for the wrapping that is filed down to feel flat. These are a rare kind of string that is not easy to find and are more expensive as well. There are a few different things you will want to keep in mind when you start shopping for electric guitar strings. More than likely, you will end up experimenting with different types of strings to find the sound that you prefer. Different guitar players will prefer different sounds so what works for one may not appeal to another. Is your playing for recreation or performance? These factors above will help direct you towards the right strings for your personal preferences and needs. Make sure that the strings you choose do not exceed your budget. You don’t want to choose strings that are too expensive to purchase when you need to replace them. Once you buy your electric guitar strings you will need to keep the long term maintenance up as well as the replacements when needed. Here are some things you can do to extend the life of your strings. Electric guitar strings are an investment in the quality and sound of music that you produce when you play. Get a low quality, cheap set of strings and the sound will show it. The opposite is true as well. While strings can make you a better player, what they will do is make the best of your skill and practice and make your hard work worth it. With the information contained in this buyer’s guide you will be able to sort through the different gauges and brands and make a confident decision that you will be very happy with. Having the right facts and knowledge can make you feel assured that you know what you are looking for and how to best choose the strings that will complement the type of music that you play or are learning to play.